Download Hour1 Download Hour2 This week in our continued reading from Charles Eisenstein's Ascent of Humanity we hear about runaway biosphere destruction, and money systems that promote altruism and cooperation instead of greed and competition. This week we begin with a remarkable talk from Greenfest 2009: John Doscher on Capitalism as Culture. 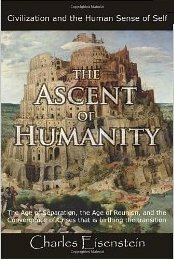 Next we continue with chapter seven of Charles Eisenstein's Ascent of Humanity, where in he address the question of despair and optimism, and demurrage currency, a system of money that encourages cooperation and discourages accumulation. The "irremediable structural flaw" in our civilization that has inspired subtle omnipresent dread and doomsday myths for thousands of years, manifests in every human institution, from science to religion to business. None is independent of the others; none can change in isolation; yet when one changes, all will change. In Chapter Six we considered the gathering sea-change in science that we are on the verge of assimilating. Now we will look at some other social institutions, beginning where the structural flaw is the clearest and its effects most explicit: the institution of money. This page was last modified on 2 November 2013, at 01:55.